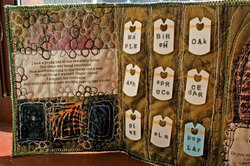 This article originally appeared on Craft Critique. After it appeared, Jami Peterson, Managing Editor of The Stampers Sampler, requested four books with stamping on them for that publication. I created four brand new books for her and shipped them this morning. I'll let you know when the issue hits newstands. In the meantime, you can see a layout of mine on page 80-81 of the current issue of Somerset Memories which is put out by the same company. On the cover of the magazine it says, "New Feature: Anatomy of a Page." That's my page that's featured! You can see it if you follow this link. It's called "Spying on My Brother." 1. Buy or recycle a hardcover book. •	Make sure it’s not a valuable one. •	I like to buy mine for a $1 from libraries or bookstores that are trying to clear their shelves. 2. Remove the dust jacket (if there is one) and discard. 3. Use a pencil and ruler to draw the size of the opening you want on the front cover of the book. •	It should be about the size of your photo. 4. Using a metal ruler and a box cutter or other knife, cut out the opening. •	Make many, many small cuts until you get all the way through it. 5. Measure ¼ inch in and cut your mat from the interior pages. •	No need to use a mat. Make one cut without a mat, which will cut through several pages. Simply remove the entire cut area. This will create a bit of depth. •	You may want to remove the first page or two of the book so that your mat will have text. Simply use your knife to slice off the unwanted pages (about half-an-inch from the book spine). •	If the text doesn’t extend all the way to the edge of the opening you’ve cut, glue another page from the book in and re-cut the opening. It’s an easy illusion. 6. 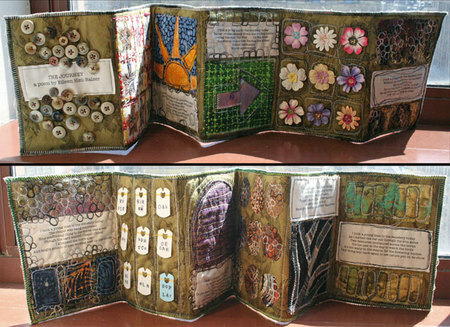 Using mod podge or any other decoupage medium, glue pages from the book or patterned paper into the opening you’ve cut. • Start on the backside of the cover and bring the paper through the opening and onto the cover. •	You’ll want to glue them down and then give them a thin coat on top to seal the project. 7. Apply rub-ons or other decoration to the front cover, spine, and backside. 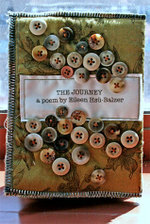 •	You could use buttons, rick-rack, ribbons, stickers, flowers, fabric, metal, stamps, etc. •	You can even decorate the pages. While the book is closed, use a stamp to decorate the page edges. 8. Glue your photo into the book. •	The easiest thing to do here is glue the photo to the first page in the book that doesn’t have a cut-out. 9. Place parchment or wax paper over your photo and glue all of the previous pages together. 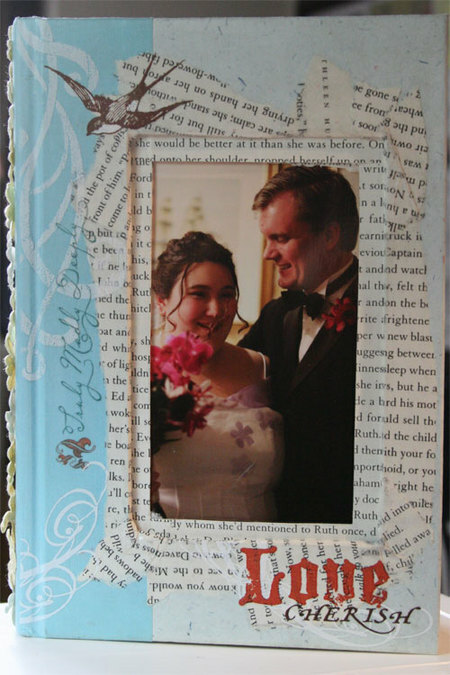 •	The paper protects your photo from the drippy decoupage medium. 10. Once dry, remove the wax or parchment paper and use a dry adhesive to glue the photo page to the previous pages. 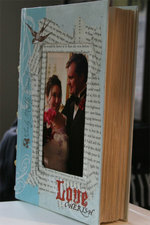 The altered book frame will stand up on its own. Just open it slightly and display. I’m sure you’ll enjoy making these and I hope you’ll share your innovations and creations with me! Last night, I went to my TAAB Quilt Critique Meeting. It was a good meeting (I always feel so motivated afterwards). Today, I find myself thinking a lot about one of the comments made last night. 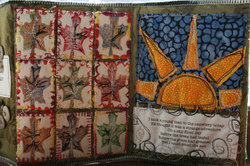 One of the ladies in the group, showed us some New York Beauty blocks she made in beautiful bright colors and wild prints. She then asked the following question, "Do you think this is serious work?" Hmmm. What does that mean? Serious work? She explained, "Serious work. Something that can be displayed in a serious gallery or exhibit. You know, serious work." "If you want it to be serious, you have to figure out what you bring to it. Do you know what I mean? 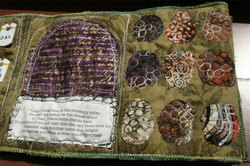 What makes it different from a quilt copied out of a book. Beyond fabric choice. Where are you in it?" It was such a simple way of looking at it. Simple, but frightening. "Serious" work seems to have only one requirement: unique-ness. So, now the frightening part: is my work unique? Do I bring myself to it? 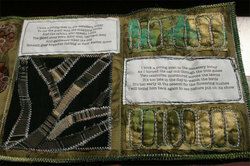 A lot of my quilting is autobiographical, so I literally bring "me" to it. But, that can't be considered unique. So, what do I bring to it? 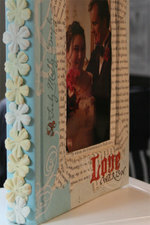 And what about my scrapbooking? My jewelry? How about the theatrical work I do for a living? "Rules act as guides in helping to build a communical discussion about interpreting and evaluating creative work. If everything is "good", then nothing really can be. Relativism is great, to a point, and then is just gets in the way of honest judgment; the result is a celebration of ubiquitous mediocrity." And I immediately thought that I'd love to know what the Peas have to say about that. Truthfully (no flames, please), my opinion is that this is true, to some degree. How many times have we seen (or received) praise that says, "Great job!" on a lo that we know, for whatever reason, is really not that great. Do we create an atmosphere of "ubiquitous mediocrity" when we praise that way? Or is the encouragement it may give more important than honesty? I immediately connected this to something I read in The New York Times about the current generation of children and teens and a problem that is arising. There are all these sports and events where they give everyone a ribbon or a trophy so that there are "no losers." Everyone is a winner. A great theory! Why make little kids feel bad? But, now it's having repercussions. These kids can't stand losing. They're furious and shocked when they get bad grades. Etc. I'm not totally sure. I guess this hails back to my post about "Who Is An Artist." Is that a word we save to describe unique creators? Creators who are not mediocre? (Can you be a mediocre artist?) Can everyone be an artist ("no losers" -- all winners)? Perhaps I'm lost in the semantics of all of it. I don't know. Have you got an opinion? 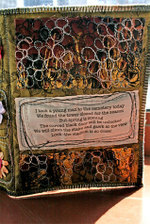 All of my quilting work is very clearly influenced by my deep devotion to, and torrid love affair with, scrapbooking. Most of my work includes either photos or text, and many of the pieces are autobiographical. This new quilt is no exception. It is titled "Bedtime Stories." The dedication on the back reads: "For my Father who told the stories. Thank you!" 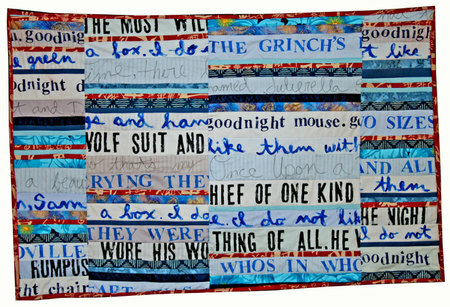 I used snippets of text from my five favorite childhood tales: How The Grinch Stole Christmas, Where The Wild Things Are, Julierella (an adaptation of Cinderella my Father made up), Green Eggs and Ham, and Goodnight Moon. Technically speaking, the quilt is very basic. 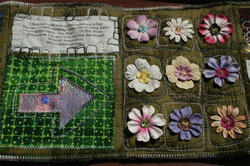 Just strip piecing and quilted "in the ditch." But, I really like the graphic feeling. The words are all either stamped or hand drawn. I feel like this quilt is a leap forward for me. Most of my work is really fussy and detail oriented. It's meant to be seen full size and up close (part of having a small workspace, I think). This is a bigger piece and it looks best from a distance (in my opinion). My New Favorite: Clear Scrapbooking Layouts! I'm totally digging the clear layout idea! Of course, the negative is, I now need to get my hands on a ton more Hambly! LOL! I think some came in this month's Scrapologie kit...I'm off to scrapbook!